Select boats for sale at discount prices in southeast Vermont at local boat dealers and outdoor centers offering a wide variety of boat types. Listed by proximity to major cities and waterways, you can find new and used boats for sale in your section of the state. Find boat dealers and other resources offering pontoon boats, fishing boats, family boats, yachts, sailboats, aluminum boats and others in southern and eastern Vermont. Listed below find boat dealers and other resources offering boats for sale. These dealers are listed nearby a city or attraction. Cities listed include Bennington, Brandon, Fair Haven, Rutland and Wells. Each dealer may represent one or more boat manufacturers. In addition to new boats, most carry a variety of used boats for sale. Contact them to see if they have the ideal boat for you. Locate boat dealers and other boat sales locations by region, then within or nearby cities in eastern and southern Vermont. If you are looking for a specific style boat for sale, chances are one of these dealers can help. Boats offered include sailboats, deck boats, family boats, yachts, pontoons, cruisers, cuddy cabin boats, canoes and, car toppers, fishing boats, inflatables, jon boats, ski boats, deck boats, aluminum boats, electric boats, jet skis, yachts, luxury watercraft and others. Click here to acquire a Boat License in Vermont. Click here to locate resources for boating equipment in southeast Vermont. If your interest is fishing, click here to find fishing boats in southern and eastern Vermont. Many quality new and used boats are offered for sale throughout the state. Whether you want to go deep sea fishing, want to catch bass and crappie, want to speed down the river water skiing, or prefer a family outing on a pontoon boat, there is nothing quite like the feeling of freedom that owning a boat delivers. Boat storage in Southeast Vermont is available at most marinas. 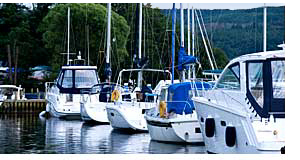 Contact a marina on the lake where you prefer to go boating for details. Marinas including Chittenden Reservoir Marina, Mountain Resort Marina and Scotts Landing either offer boat storage or can refer you to a resource for secure boat storage. Lending institutions offering loans in your area can help you handle boat financing issues. They can quote rates and terms for boat loans in Vermont. You might find ways to save by requesting quotes from several loan providers. Often the boat dealer, where you purchase your boat, will offer financing options. If you are buying a new or used boat it is highly recommended you acquire boat insurance to protect your investment and the members of your boating party. Find boat sales in other states.